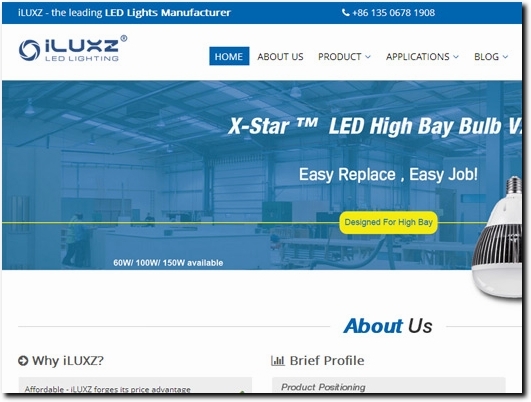 iLUXZ is a leading industrial LED lighting manufacturer in China. Since 2009, we"ve been supplying and exporting reliable LED products (LED flood lights, LED high bays lights, waterproof LED lighting fixtures, high power LED bulbs, linear/ LED tri-proof/ LED battens, T5/T8 LED tubes, LED street lights and LED retrofit kits) to the global market. Over the years, iLUXZ has established sound relationships with businesses in the manufacturing, warehousing, transportation, logistics, real estate, architectural design, and facility management sectors. iLUXZ possesses a LED encapsulation facility with ASM die-bonding and soldering equipment to produce high-quality LED packages, and SMT production lines for both LED driver and LED lights production. We"re also extremely proud of our skilled and conscientious workmen on efficient assembly lines with an annual output of 2.5 million sets of high-quality LED light sources and lighting fixtures. Moreover, we are well-equipped with an in-house test lab, which provides us with strong R&D capabilities and the ability to perform accurate product inspections. • Using first-rate manufacturing practices to provide "turnkey" solutions. • Providing professional expertise and swift quotations on time. • Forming ongoing partnerships with customers to help them get their products to market faster and more economically. • Offering a diverse range of products that fit the many different demands from our customers to ensure they don"t miss out on business opportunities. • Ensure non-stop product innovation to win in the fast-moving market. China (Zhejiang) based business - established in 2009 - providing LED lighting products. Website includes product catalogue, testimonials, details of business premises, associations, regularly updated blog, full contact details.